The MIC Series 612 camera has been designed to offer an extremely reliable, robust, and high-quality surveillance solution for security applications that demand the very best performance. Precision engineered to exacting standards, the camera offers the most ruggedized dual optical/thermal image capture solution available on the market today. When powered by a MIC IP Power Supply, the MIC camera becomes an IP-enabled device with extra features such as Intelligent Video Analysis (IVA), and the ability to record video on a network-attached RAID iSCSI storage device or locally on a user-supplied SD or SDHC card (32 GB maximum). The optional “hybrid” operation provides video and control of the MIC camera over both analogue (Bilinx over coax) and IP connections simultaneously. Image control and quality are integral aspects of any PTZ camera, and the MIC612 delivers. A high-quality day/night camera core with 36x optical zoom lens and a full 12x digital zoom, and a high-performance, uncooled thermal imaging core sit side-by-side within the housing. 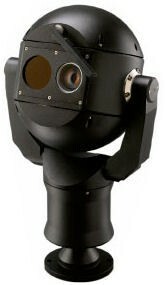 Each MIC612 has two video outputs – one for the optical camera, and one that is user-switchable between the optical camera and the thermal imager. The optical camera provides 550 TVL of horizontal resolution for outstanding clarity and image detail, and incorporates Wide Dynamic Range (WDR) that dramatically improves the dynamic range by 128 times and results in clear image reproduction in extreme high-contrast environments. Features of Auto Scaling (proportional zoom) and Auto Pivot (automatically rotates and flips the camera) ensure optimal control. Day/night capabilities and outstanding sensitivity make the MIC612 an exceptional performer in all lighting conditions. In low light, the optical camera automatically switches from colour to monochrome by removing the IR filter to boost sensitivity, while maintaining superior image quality. For operation in the darkest conditions, the SensUp control feature automatically reduces the shutter speed to as little as one second. This increases sensitivity by more than 50 times. In addition to low light applications, the optical camera is also an exceptional performer when viewing under a sodium vapour lamp (for example, a street lamp or tunnel lamp) which normally gives a yellowish tint to images. The camera automatically compensates and restores objects to their original colour. The thermal imager has user-selectable colour options including White Hot, Black Hot, and many others, and built-in sun protection that allows the camera to self-heal if pointed directly at the sun. Standard-resolution models include a user-selectable on-screen temperature display (spot meter) feature. These models allow users to set high or low thermal temperature limits and then to use the measured temperature value from the spot meter to trigger alarm functions based on those limits. Subjected and certified to rigorous dust and immersion tests (IP68 and NEMA 6P), MIC Series cameras are perfectly suited for installation in even the most unforgiving environments. Reliable ‘O’ ring seals completely protect the internal components from the external environment, meaning that there is no need to pressurize the camera. To guarantee the seal, the factory subjects each MIC camera to a 100% leak test before shipping. In addition, the cameras’ aluminium construction is protected from corrosion by two different processes: first, the cameras receive a coating of Alodine 5200, a chromate-free conversion coating of aluminium that is used in the aerospace and defence industries where a protective layer is required to improve corrosion resistance. Second, they receive a robust, powder coat layer of paint. The MIC612 incorporates Bosch’s standard controller interface supporting familiar on-screen menus and multiple protocols, including Bosch “Biphase (OSRD),” “Bilinx,” and Pelco “P” and “D.” This makes it simple to integrate and use the camera within systems that already use Bosch AutoDome cameras and systems. Brushless motor technology ensures ultra-reliable operation with full 360° continuous rotation pan for exceptional viewing capability. The camera supports 99 pre-positions and two styles of Guard Tours: Preset and Record/Playback. The preset tour has capability for up to 99 pre-positions with a configurable dwell time between pre-positions, and can be customized as to the order and frequency each preset is visited. The camera also provides support for two recorded tours, which have a combined duration of 15 minutes of movements. These are recorded macros of an operator’s movements, including pan, tilt, and zoom activities, and can be played back in a continuous manner. Superior privacy masking and Image Stabilization The MIC612 has 24 individual privacy masks, with up to eight displayed in the same scene. Unlike conventional privacy masks, these can be programmed with three, four, or even five corners each to cover more complex shapes. Each mask changes size and shape smoothly and quickly, ensuring that the covered object cannot be seen. Each mask can appear in black, white, or blurred. Blurred is useful when privacy is an issue, but determining the presence of motion is still required. As PTZ cameras continue to increase their optical zoom capabilities, image stabilization becomes critical to eliminate movement caused by unstable camera mounts. A mere quarter-inch of movement of the camera mount can shift the field of view by more than 6 m (20 feet) when the camera is zoomed to a high value. This can render images unusable. Image stabilization algorithms in the optical camera reduce camera shake in both the vertical and horizontal axis, resulting in exceptional image clarity (pixel displacement up to +/- 10% for frequencies up to 10 Hz) without reducing camera sensitivity. The MIC612 is compatible with all MIC Series brackets and control equipment for easy installation, integration, and operation. These brackets, as well as connection cables and power supply units for the camera, are sold separately. The camera can be installed upright or inverted. No matter the installation position, the camera will operate faultlessly. Bosch’s Configuration Tool for Imaging Devices (CTFID) allows users to control the PTZ, change camera settings, and update firmware from remote locations without need for additional wiring. The camera has advanced built-in diagnostics to simplify service and minimize downtime. Using the Onscreen Display (OSD), a technician can quickly and easily check critical parameters (such as internal temperature) to verify that the camera is functioning within acceptable operating limits. Thanks to its integrated wiper, the MIC612 is able to capture the highest possible quality image regardless of the weather. MIC-612TIALB36P PTZ, dual thermal/optical camera, PAL, Black, 36x optical zoom, 320x256 thermal picture elements, 8.3 Hz thermal imager frame rate, 35 mm thermal lens. MIC-612TIALW36P PTZ, dual thermal/optical camera, PAL, White, 36x optical zoom, 320x256 thermal picture elements, 8.3 Hz thermal imager frame rate, 35 mm thermal lens. MIC-612TIALG36P PTZ, dual thermal/optical camera, PAL, Grey, 36x optical zoom, 320x256 thermal picture elements, 8.3 Hz thermal imager frame rate, 35 mm thermal lens. MIC-612TFALB36P PTZ, dual thermal/optical camera, PAL, Black, 36x optical zoom, 320x256 thermal picture elements, 25 Hz thermal imager frame rate, 35 mm thermal lens. MIC-612TFALW36P PTZ, dual thermal/optical camera, PAL, White, 36x optical zoom, 320x256 thermal picture elements, 25 Hz thermal imager frame rate, 35 mm thermal lens. MIC-612TFALG36P PTZ, dual thermal/optical camera, PAL, Grey, 36x optical zoom, 320x256 thermal picture elements, 25 Hz thermal imager frame rate, 35 mm thermal lens. MIC-612HIALB36P PTZ, dual thermal/optical camera, PAL, Black, 36x optical zoom, 640x512 thermal picture elements, 8.3 Hz thermal imager frame rate, 50 mm thermal lens. MIC-612HIALW36P PTZ, dual thermal/optical camera, PAL, White, 36x optical zoom, 640x512 thermal picture elements, 8.3 Hz thermal imager frame rate, 50 mm thermal lens. MIC-612HFALB36P PTZ, dual thermal/optical camera, PAL, Black, 36x optical zoom, 640x512 thermal picture elements, 25 Hz thermal imager frame rate, 50 mm thermal lens.